I think Im going to take this showcase room by room. Who knows, maybe I'll decide to combo up some rooms together along the way. You'll just have to wait and see. I know you are in total suspense. 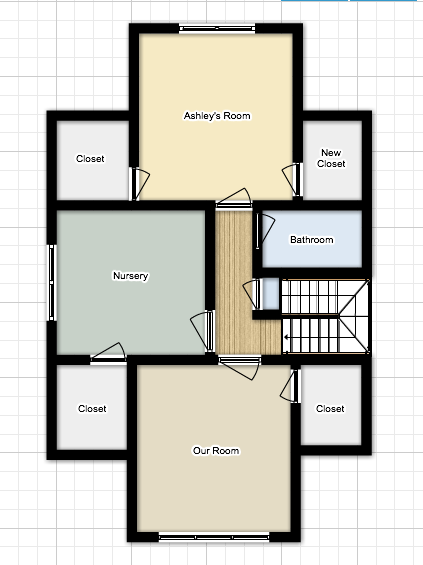 As a reminder, I once posted these floor plans…which I think will probably be quite useful for reference. They are, of course, not to scale, and some of the rooms have changes since I made them…for example, "Ashley's room" became our room, etc. But anyways. I had them, so here they are. 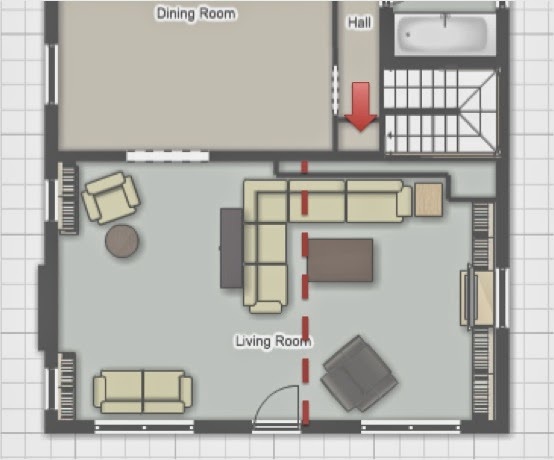 As you can see, our Living Room spans the whole width of our house. It is a gloriously large room and the very first thing that struck me when I walked into the house. History lesson time! It turns out that there used to be a 5th bedroom in our house. Seeing as it was built in 1927, this makes sense, but I am super glad that along the way someone decided to bust out a wall and make a bigger living room. You can see where the wall originally was here, and the entrance was the door that is now a closet in our hallway (the arrow). Fun! History lesson complete. In any case, once upon a time our Living Room looked like this. It was set up sort of awkwardly with lots of seating space, but not much definition. I had grand ideas of what I wanted to do, but had to wait a while for them to come to fruition. The Joes (we bought the house from two such friendly and welcoming men named Joe and Joe) didn't have any children, so they used the back bedroom as a TV den of sorts, so this room really just was for sitting. 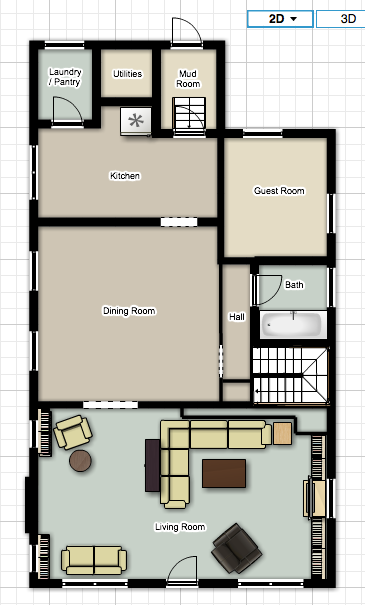 We, on the other hand, needed a functional layout for a television and living space. First, we painted it green (the same color as the dining room). I striped down the dinky little mantle, stained it to match the rest of the woodwork (it was painted tan before) and painted the brick white. I actually hate the idea of painting brick unnecessarily, but this was ugly flat, red brick. Painting was necessary. Then - we bought a green couch, so decided to paint the room blue. This blue was entirely too blue. Then we found the perfect blue, painted the brick gray and built out a mantle for better proportions. On the other side of the room, we repainted the bookshelves, installed new hardware on the cabinet doors, built in shelves underneath the window/TV area, and I sewed a little valance for that window. As far as the layout is concerned, we split the room using a sectional sofa, so that we have two defined seating spaces, and a nice little entry area between my new little nook next to the door and the console table behind the sofa. …well the second we could never figure out. When they knocked down the wall for the bedroom, they also dropped the ceiling to hide the support beams. So, we always sort of figured that there had been some sort of overhead lighting that the switch belonged to hidden somewhere up in there. …but then. Legitimately like a month ago. I was sitting on the floor with the kids in front of the fireplace. And a ball rolled underneath the bookcase to the left of the fireplace. Lo and behold - there, tucked all the way in the back, was an electrical socket that we never knew existed. The socket and plate were the EXACT same color as the wall and it is super dark under there! Guess what it was connected to? Yup. That's right. The second switch. To which this lamp is now connected. True to its name, this room has been used for living. Both of our kiddos have taken their very first steps in here. We've watched more movies than I could count. Almost every single one of my bump series photos for both kids was taken in front of that fireplace. It has been decorated for every holiday. Snuggles, races, naps, late night nursing sessions, late night drinking sessions, birthday parties and plenty of messes. It is a room made for living, and we have done just that, here, in our Living Room. 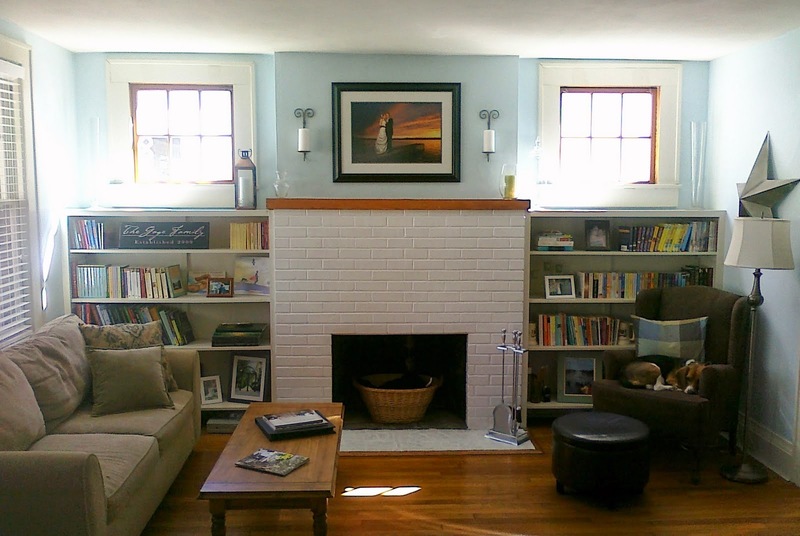 …and considering how much I disliked that fireplace originally, I sure am going to miss it now. 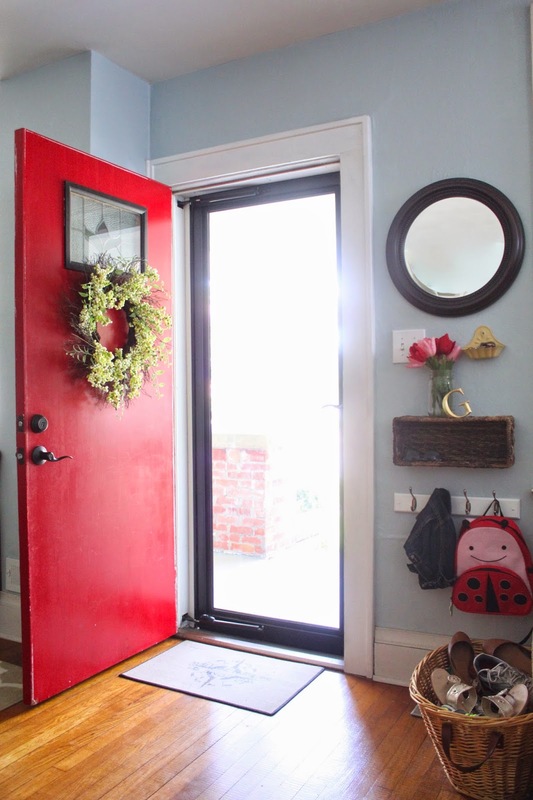 Love reading along in this series of posts - your house is gorgeously decorated! 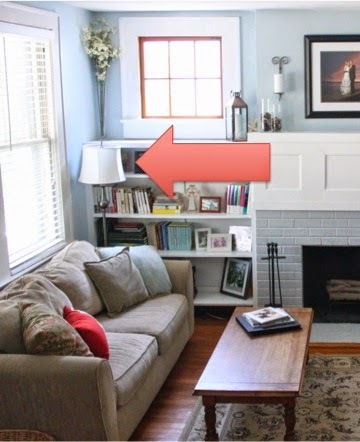 I especially love what you've done with the built-in bookcases in the living room. We have a massive one in our basement and I am at a complete loss on how to style it. Yours looks straight out of a magazine! Thanks, Heather! I will admit - my husband and sister made incessant fun of me as I obsessed over arranging them. It was much easier pre-children to lay everything out on the floor. I can't even imagine doing that now.